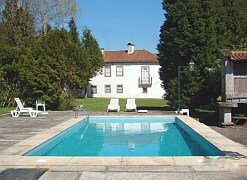 Accommodation at Casa das Paredes. This beautifully restored manor house dating from the seventeenth century is situated in a private wine producing Quinta on the outskirts of the small town of Fafe in the Minho region of Northern Portugal. 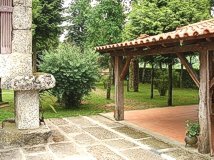 Built from local granite, Casa das Paredes is an excellent example of a manor house of this period, and is furnished with antiques and fine paintings which add to the ambiance of the house. Approximately ten kilometres to the southwest is the historic town of Guimaraes. Known as ’ the cradle of the nation’, it is the birthplace of the first king of Portugal, Afonso Henriques. He was born in the impressive tenth century castle, and established the first Portuguese court here in the twelfth century. The historic centre of Guimaraes was considered World Heritage by UNESCO. The town has some wonderful Medieval buildings: The Paco dos Duques, once the residence of the royal house of Braganca, and the impressive church of Nossa Senhora da Oliveira. To the west of Fafe is the religious capital of Portugal, Braga, with many fine churches and monuments of note. It has a vibrant cafe culture and plenty of restaurants to suit all tastes and pockets. Portugal’s only National Park, Peneda Geres, is situated to the north of Casa das Paredes. This walker’s paradise is an undiscovered wilderness of stark granite mountains, crystal streams, and verdant forests. The beautiful Queimadela dam, ideal for walkers, is situated only a kew kms from Casa das Paredes. Casa das Paredes is set in acres of beautifully tended gardens with ornamental ponds and fountains, and shady arbours for relaxation. The house is centrally heated and has eight bedrooms, some with private balconies or verandas and two 1 bedroom cottages with kitchenette. The ground floor has two double bedrooms, one with ensuite shower room and one with ensuite bathroom, one twin bedded room with ensuite shower room and one single room with ensuite shower room. There is a comfortably furnished sitting room with open fire, television and games table. On the first floor there are three double bedrooms and one twin bedroom all with ensuite bathrooms. Off the hallway there is a music room with piano. Next to this room is the guests’ dining room where breakfast is served. 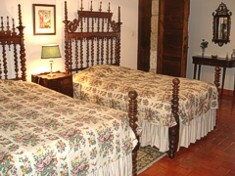 All rooms are exquisitely furnished with great attention to detail. 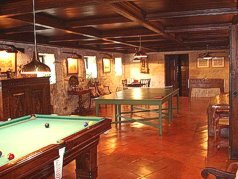 The former wine cellar has been converted into a games room with a Portuguese pool table, table tennis, games table and table football. The property has a 2 kms jogging or cycling track. Bicycles are available for the use of guests. Outside there are patios with comfortable seating where one can relax with a glass of locally produced Vinho Verde wine. A short stroll through the fragrant gardens with playground and small woodland leads to the swimming pool which is shared with the guests of the two small self catering cottages in the grounds. Casa das Paredes offers a relaxing holiday in beautiful surroundings. 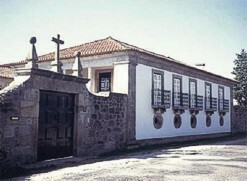 Casa das Paredes. The housekeeper Emilia greeted us (including the glass of port) to the house . We were the only people staying for most of the week. Breakfasts were adequate but rather basic ( no fruit etc) . The house was clean and well appointed with the exception of the kitchen which had old and battered kitchen utensils especially saucepans. A BBQ would have been useful. The house was well positioned for visiting the area, and was quiet and peaceful. We spent a week in July at Casa das Paredes near Fafe in northern Portugal. It was ahead of the school holiday period and the manor house was truly wonderful and the time there very relaxing. We spent our days either just relaxing in the grounds or going to somewhere not more than one hour drive away for a wander and lunch. As we stayed in a cottage rather than the main house, we had a small kitchen. That meant that evenings could be spent simply enjoying the sunset accompanied by light food and wine that was both excellent and well priced. We live in Canada and basically it was pretty much a perfect R&R period in the middle of a European trip that was 6 weeks long in total. The only thing to mention to anybody who plans to do something similar is that we found that leaving our GPS at home was a mistake. Road signage is minimal at best and even with help of very friendly locals we got lost rather too often.